SLUGGISHA.BLOGSPOT.COM: WGOD 8/26-27/2016 SUPER-EXTENDO 4 1/2 HOUR G O Dcast PODCAST OF MUSIC YOU WILL HEAR NOWHERE ELSE!! 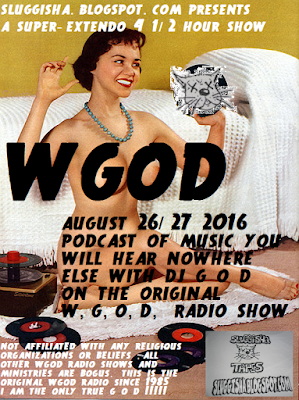 WGOD 8/26-27/2016 SUPER-EXTENDO 4 1/2 HOUR G O Dcast PODCAST OF MUSIC YOU WILL HEAR NOWHERE ELSE!! THE NEW LEFT CLASS - As Seen On T.V. That's a spicy meat-a-balla! I can't believe I ate the whole thing! Watch this weekend for Labor Day show ,probably kicked out on Thursday/Friday of this week! Till then ,enjoy! G O D .